Here in California, Spring is bringing super blooms everywhere, from sleepy hillsides to the desert floor. 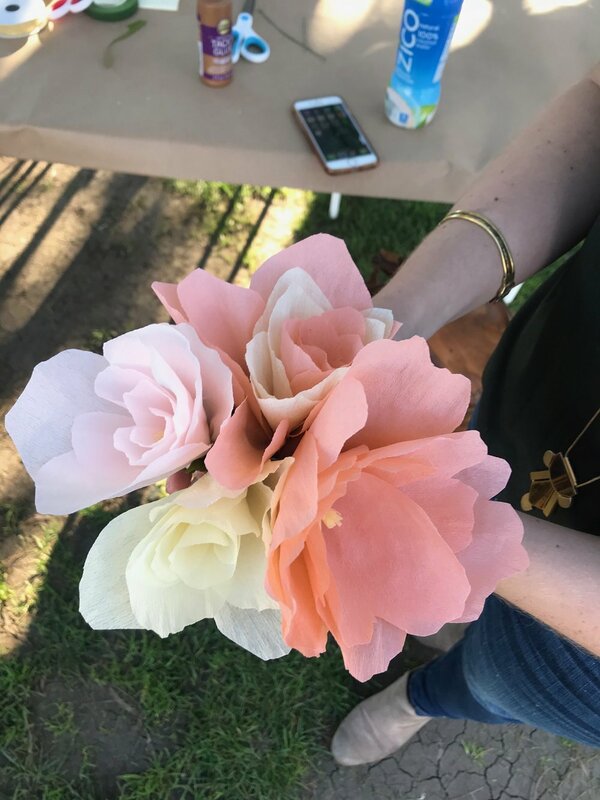 On Saturday, we made paper flowers in Venice, CA, to bring the inspiration home. We have a few flower petal stencils to work from for peonies, roses, and other small flowers. It’s fun to use two different stencils for one flower -- the smaller petals go on the inside, and the larger petals go on the outside. Each petal is shaped like a shallow bowl before it is attached to the stem. There are some gorgeous colors of crepe paper out there. Why limit yourself to a red rose or one color of pink for a peony? There are creamsicle roses, yellow and purple irises, and even green flowers. Mix conventional or unconventional colors and your bouquet will love you for it. More petals, more tape, more glue. The more petals we used, the more excited we got about our flowers. On that note, we used more floral tape and wrapped it higher where the petals meet the stem to really girdle those petals in there. And to attach that tape, even though it sticks well to itself, we used dots of tacky glue every inch or two twisting it down the stem. What flowers do you want to create?